It may fall short of a world record holder, but a massive pumpkin grown in a Saanich backyard still has neighbours in awe. Bryan Sloat is a veteran pumpkin grower who has been producing gigantic gourds for the last two decades. "I do pretty good at the fair every year," the Saanich man says with a laugh. But this year Sloat has outdone himself. Tipping the scales at 1,500 pounds and standing four-and-a-half feet tall, this year's pumpkin is his largest yet. "You've got to work on the soil," he says. "Every year you put your mulch in and all your grass clippings so it's nice and loamy, so it holds the water, and then you plant it on one end of the garden." Pressed further, he shares the key to dominating annual pumpkin contests. "This is the big secret: You bury the vines as it goes," he says. "When you bury the vines underneath as the stems come down, there's a little white nodule that turns into a big root ball. Typically if you've got 500 leafs, which is conservative, you basically have 500 plants sucking at water going to the one pumpkin." 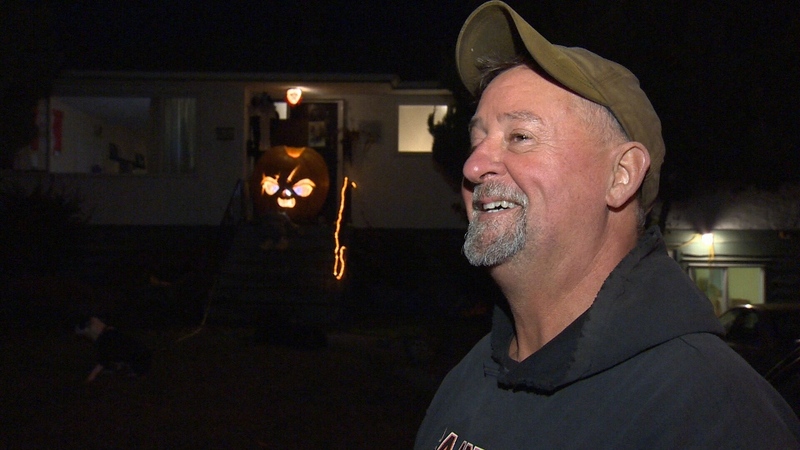 Neighbours on Dunn Avenue say Sloat's annual pumpkin project has become a Halloween tradition. "It's pretty awesome. 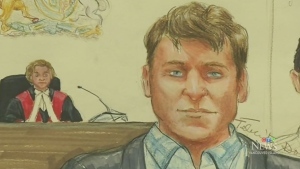 This is about the fourth or fifth year that it's been the centerpiece across the street here, and every year it seems to get bigger and bigger," one told CTV News. It was so big that it took seven people, a four-wheel dolly and a ramp to get the pumpkin up on Sloat's front step. "And a lot of grunting," he adds. 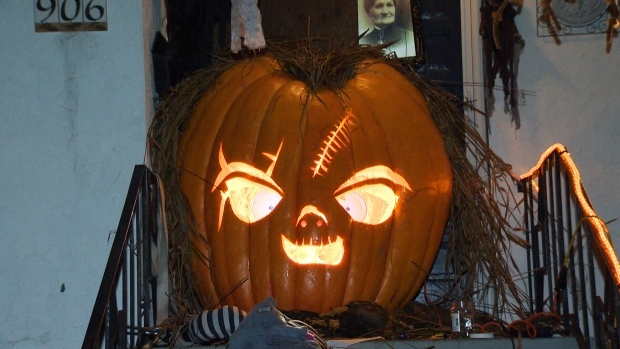 Sloat then went to work fashioning the pumpkin into a spooky jack-o-lantern to greet trick-or-treaters. Last year, he carved Pennywise the Clown from the movie "It." This year, he's drawing inspiration from the slasher films "Child's Play" and carving up a Chucky. 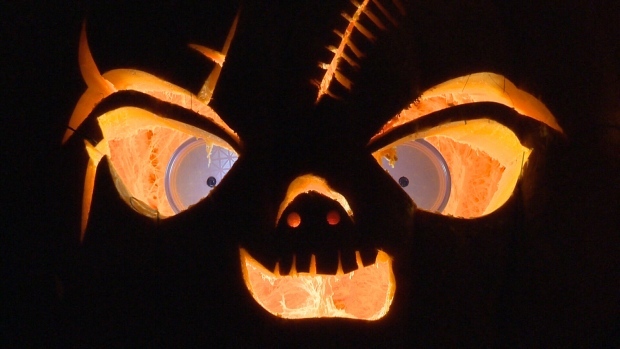 After Halloween night, he says the pumpkin will meet its demise on the weekend. "Tie it to the back of the van, then we're gonna drive away and watch it until it explodes," says Sloat. While the enormous pumpkin may top the scales on Vancouver Island, it's just a few hundred pounds short of this year's record holder. That title went to an Oregon farmer who grew a 2,170-pound pumpkin dubbed the winner at the Safeway World Championship Pumpkin Weigh-Off in California earlier this month.